Continuing our search for the best men’s monthly subscription service — and specifically the duel between SprezzaBox and Gentleman’s Box (the two most similar services) — here are my thoughts on the latest, October box from SprezzaBox. Maestro Watch — $105: The sheet that lists what is included in your SprezzaBox each month spent quite a bit of words explaining how this is the most expensive item ever to be included in a box. And, yeah, it is expensive to be included in a box like this. This is the sort of watch that would come in the lowest tier WatchGang subscription, which is $30+ in its own right. There is no doubt about it — this watch alone pays for this month’s box. This is at the very least a watch worth $28. It’s a beautifully minimalistic face, with nicely tapering minute and hour hands, and a gorgeous contrasting light blue second hand. I appreciate the Roman numerals for the hour markings, and I like that the strap is black. That all being said, this is in no universe a $105 watch. A $50 Timex feels much heftier and higher quality than this thing, and has far superior leather as well. The watch feels lightweight to the point of being cheap, and the leather is super, super stiff, despite not looking too bad. That all being said, swap out the band for another one that you like, and this thing would not at all be a bad watch to throw on every once in a while. In short, if I spent $105 on this watch, I would feel beyond ripped off (and thus the problem with these sorts of boxes and their quoting inflated ”retail prices” of the items inside). Getting it as just one of many items in a $30 monthly box? Freaking unbelievably awesome. I have never seen an item like this included in Gentleman’s Box. I am super impressed with this inclusion. An unexpected and welcome surprise that I will gladly add to my watch collection. Very well done, SprezzaBox. AN IVY Blue and White Necktie — $48: Again, a $48 tie? No. A solid, more-than-good-enough quality tie to throw in your rotation? Absolutely. Once more, these two items alone and you are so far ahead of the $28 you paid for this box. Throw this on with a great suit and white shirt (and the socks reviewed below), and you’re looking real fine. Alara White Tipped Pocket Square — $24: Not worth $24, but is a nice, classy pocket square that is super versatile. Awesome inclusion; I like this guy a lot. Goes great with just about any color suit (except for black; though, if you fold it right, you could probably use this as a solid white square as well without the tipping). Sprezza Socks — $12: I made the point last month that it is perhaps the tiniest bit disingenuous for SprezzaBox to have their own line of socks that they set the retail price for, and then include it in a box as some sort of amazing value. Still, they are undoubtedly solid socks that look and feel good so I can’t really complain much beyond that. I like the blue and white here. Very solid and versatile pattern that would look great with chinos and some brown loafers (might be a bit too blue to wear with jeans, though). Classic Pen — $10: In all honesty, when I found the pen in the box, I was more excited than I was when I saw the watch! Feels nice and has got some weight to it, writes real nicely as well, and, hey, who is going to say no to a “free” $10 pen? Most people spend that much on a pack of a dozen pens, not one. So, I was pretty excited. However, I was a bit disappointed in actually using it. The ink breaks up a bit here and there, and the hard and sharp indent where the pen tapers once you remove the cap becomes quite uncomfortable after a bit of use. Look, I keep it in my bag and I’ll use it every once in a while. But this is not going to become your go-to pen. Hands down, this is the most impressed I have been with any box from any subscription service. 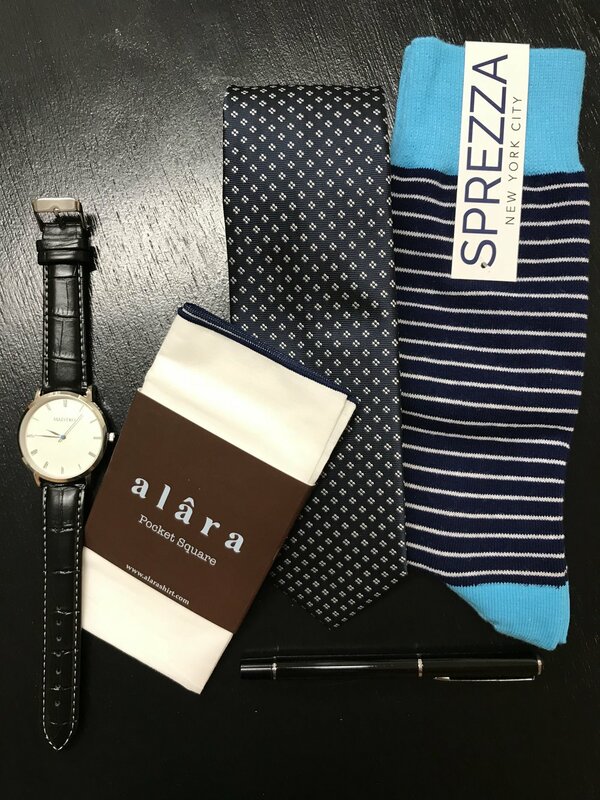 The inclusion of a solid watch (the sort of thing that would be the only thing you receive with other services) in addition to all the usual stuff — as well as the unique and clever inclusion of something like a nice pen, instead of only the classic tie, socks, pocket square, etc. — shows that SprezzaBox really thinks about the whole “gentleman” lifestyle, not just giving you accessories. There is, therefore, more value to this box than simply filling out your tie or sock collection. We will see what Gentleman’s Box has in store for this month in the next few days, but I doubt it can touch this. The few dollars more a month SprezzaBox costs has clearly allowed them to do some really great things here, and I think we are seeing a winner between these two slowly emerging. I think SprezzaBox is undoubtedly pulling ahead. In short, you truly never know what you are going to get from SprezzaBox, and, so far, I have always been pleasantly surprised — this month especially.